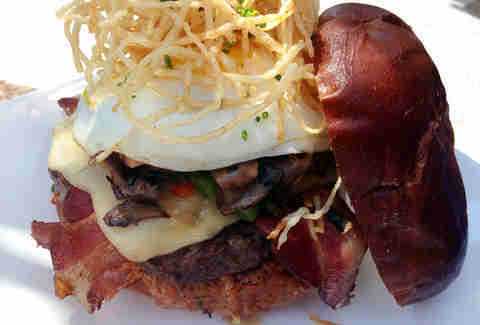 It’s after Labor Day, which means three things: you’ve put away your white pants, you’ve drafted the perfect fantasy football roster (“Danny Amendola is TOTALLY staying healthy this season!”), and finally, Chicago burger joints are rolling out some stellar September specials involving bacon sausage, huevos rancheros, and beer-battered tamales. So eat them before October rolls around, when you no longer can. 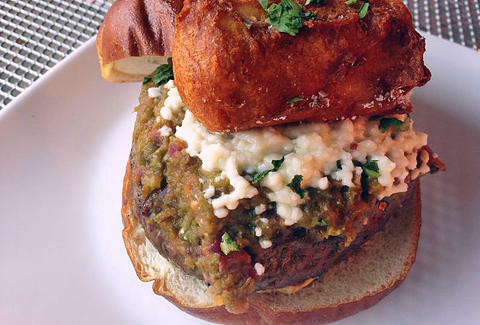 If you're avoiding beef for whatever reason (maybe you just watched City Slickers again), this Moroccan Lamb Burger checks in with feta, roasted tomatoes, red onions, and a double-sauce threat of gallego and tzatziki. Filling in the rotating #15 slot, DMK’s menu is this breakfast-y Mexican mashup that's even more appealing than a waffle taco. 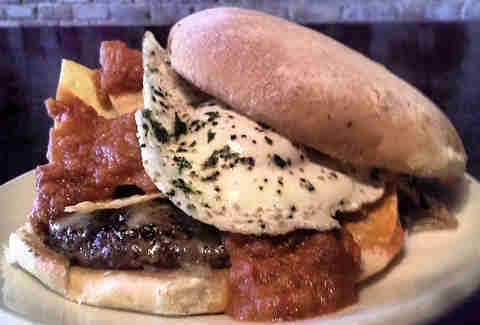 This burger's topped with huevos rancheros, Sonoma jack cheese, tortilla chips, and house-made salsa. Available on weekends only, The Gridiron burger (black angus beef, grilled Polish sausage, bacon-braised sauerkraut, whole grain mustard) will help you stay calm and collected during NFL Sundays... even when Jay Cutler doesn’t. We couldn’t possibly choose between two siblings -- like Vin Diesel says, "You don't turn your back on family, even when they do," -- so we have specials from both Kuma’s locations. The Sword (pictured up top) at the original Kuma’s -- named for the heavy metal band from Austin -- has jalapeno aioli, cactus salsa, queso fresco and a beer-battered tamale, whereas Ultimate Dragons (the little known precursor to The Sword) at Kuma’s Too packs bacon, smoked Gouda, cayenne mayo, black forest ham, a fried egg, and salt/malt vinegar-seasoned potato strings. 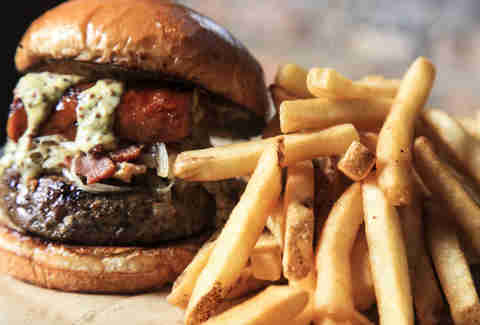 So yeah, you actually have six burgers to eat this month. Deal with it! 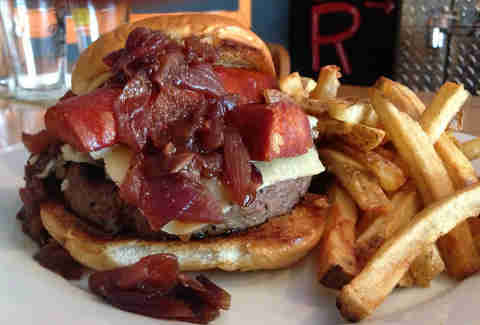 The Ultimate Bacon Cheeseburger achieves its ultimateness (which we just shockingly discovered is actually a word?!) 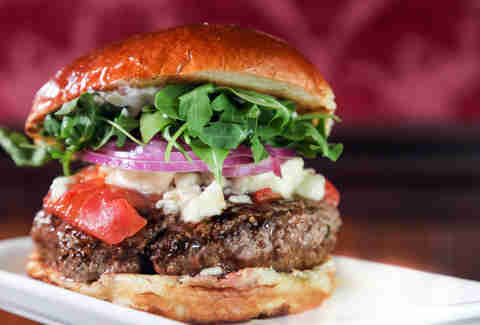 by way of a ground short rib burger with smoked bacon sausage, sweet gorgonzola dolce, and red onion jam. Often a precursor to The Ultimate Angioplasty.